1920 FULLY UPDATED LARGE LUXURY FARMHOUSE ON ORGANIC FARM*LOADED WITH AMENITIES! IN THE CENTER OF JUST ABOUT EVERYTHING BUT STILL SECLUDED AND RURAL! 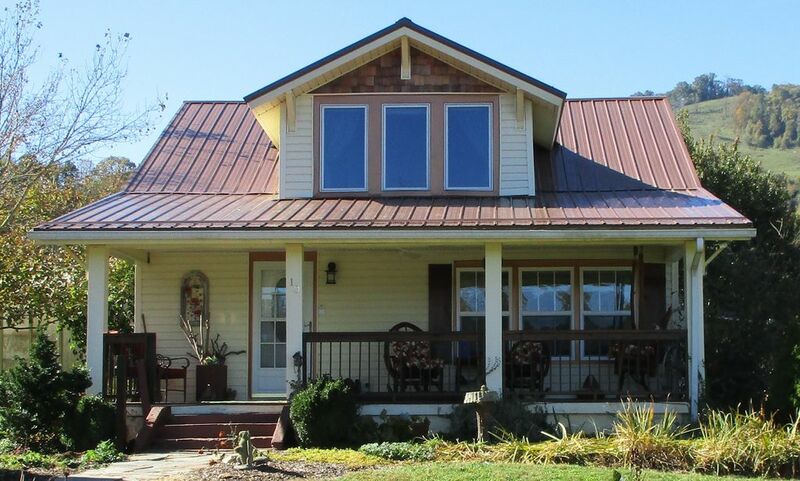 This beautiful, peaceful farmhouse is located in the quaint town of Waynesville, 10 minutes from an award-winning Downtown Main Street full of cafes, art galleries, restaurants, coffee shops, live music and just about any shopping you can imagine nearby. Enjoy nearby adventures including: waterfalls, hiking paths, tubing, golfing, skiing, fishing, wildlife viewing, mountain biking, Lake Junaluska, Waynesville, Maggie Valley and Asheville! A Magical Farm in the Smoky Mountains where Nature Rejoices . . . Experience the comfort and coziness of this 1920’s farmhouse nestled amongst the Great Smoky Mountains, which has been fully renovated and updated to include all of the luxurious comforts of home, including a fully-equipped gourmet kitchen with inside dining seating for 10 guests. The Gardener's House at Frog Holler combines a beautiful farmhouse with gardens, ponds, breathtaking mountain views on all sides and farm life to it’s fullest! Experience real 'country living' with cows, horses and chickens lazily grazing on neighboring mountainside pastures. No sharp turns or steep inclines makes our home convenient and accessible in all four seasons. 2 MILES FROM I-40--EASY ACCESS! A short drive to Pigeon Forge (Dollywood), white water rafting, Gatlinburg. 10 MINUTES TO NEW, BIG GROCERY STORES! The Gardener's House has reliable high speed internet and wi-fi included. It also has Satellite TV with two new big flat screen televisions. Enjoy a relaxing night's sleep on our high-quality mattresses and organic lavender-scented linens! Sleeps 9 Adult Guests in beds and a comfy couch. There are also 3 twin foam mattresses and complete bedding for additional guests/children to "camp-out" in the library/den/loft or bedrooms. Everything you need to start your vacation off right---high quality linens and towels, soaps, lotion, shampoo, kitchen cleansers, coffee/tea bar and other goodies. Just buy groceries and your favorite brands at one of the 3 major grocery stores--including the brand new huge Ingles and Publix, just 10 minutes away! Relax on the porch swing or rockers while songbirds flutter amongst the flowers and birdhouses. Be mesmerized by the large variety of butterflies floating from bloom to bloom. Curl up in bed on Summer evenings cool enough for a light blanket, even in July! (50's - 60's degrees at night is the norm!) Just open the windows for the cool nighttime breezes and experience 'Mountain Air-Conditioning!' Although the farmhouse is air-conditioned, you may feel you do not need it with the great low mountain temps and low humidity. Be lulled to sleep by the night sounds of the frogs’ lullabies and the waterfall outside your bedroom window. You may even hear the mournful wail of a coyote in the distance. Amongst the beautifully landscaped flower and vegetable gardens are two ponds, a large one in the garden area and another tableside by your kitchen and master bedroom windows! Be greeted each morning by large Koi fish from their window-side pond. Stroll down lavender-lined paths through gardens strewn with fountains and statuary. Enjoy all the comforts of a home, not a rental. You should find just about everything you need for a comfortable and memorable stay. Pets welcome --just click "Pets" when booking. See "Rates" for small pet fee. No Security Deposit!!! Just like a Hotel, we authorize a credit card to save you paying a deposit or buying insurance. No damage, no charge. See Rental Agreement for all terms. WEDDINGS AND SPECIAL EVENTS AT THE HOLLER! Enjoy a very special fairy tale wedding and honeymoon, anniversary party, family/friends reunion or other special event at the farm! The farm is flat and in a secluded location with beautifully landscaped grounds--all for a very low price. Special Event packages start at $999.00. Just email us for more information. *Complimentary produce, eggs and flowers harvested by staff and provided when available/in season. HANDICAP EQUIPMENT AVAILABLE: BATH SEAT, TOILET RISER, BEDSIDE TOILET, WALKER WITH SEAT, STANDARD FOLDING WALKER. Available for our guests' use at no charge. Just give us notice so we can have them in your rental when you check-in. Many sites pick up rental information from other sites and do not always list it correctly. VRBO/Homeaway are generally correct. Owner/Landlord is not responsible for errors caused by other third-party rental listing sites. Robyn is Rental Manager for The Gardener's House at Frog Holler, which is family owned and managed. She and her parents moved to the beautiful Smoky Mountains from Virginia Beach, Virginia in 1999 to enjoy mountain and farm living. Mom is still active with farm life and harvests in the gardens -- at the age of 97! Fortunate to grow up on several family farms, Robyn has continued her love of the outdoors and creative farming techniques. Since retiring from the legal, real estate and construction fields, she has developed three farms and multiple vacation rentals. She stays busy also as a Vacation Rental Consultant and/or Farm Consultant. The farm is in the middle of just about everything! Even though it is in a very rural area of farms surrounded by beautiful mountains, it is only minutes from Downtown Waynesville, Maggie Valley, Lake Junaluska and Asheville and all their great events--The best of both worlds. If you want a trip to the city, you are 20 minutes from Downtown Asheville. We are just over the mountain from Maggie Valley--about 10 minutes, just 12 minutes from Downtown Waynesville and 5 minutes from Lake Junaluska! And being only 2 miles from Interstate 40 gets us everywhere really fast and easy. The location is also great in challenging Winter weather since the road is flat to get in and out of the farm and it is centrally located in areas where the roads are cleared in increment weather. The farm offers a serene atmosphere to get away from it all. Become another one of our wonderful regular guests who visit each year! Enjoy fresh veggies, fruit, flowers and eggs from the farm. It does not get any more 'Local' than that! The farm is teaming with songbirds and much wildlife, butterflies, frogs, bees, hummingbirds, not to mention the surrounding mountain pastures with cows and horses, chickens. Just sitting on the deck in the afternoon is an experience you will not soon forget. There is so much activity between all the beautiful flowers. Enjoy a bonfire by the pond at night while listening to a multitude of frogs', coffee on the deck in the morning next to the waterfall and koi pond while enjoying the mountain views. All of this is just minutes from great hiking, rafting, art galleries, festivals, and so much to do. You will want to return again and again like many of our repeat guests (and like we did!). The area consists of mountain views, mountain pastures and farms but only minutes from Downtown Waynesville and Asheville. Mountain views on all four sides! Just 5 miles to the awesome Health and Fitness Center at the hospital. Steam, Sauna, Heated Pool, whirlpool, free-weights, great machines, basketball, yoga classes, banked track. Nominal fee. 1920'S original woodstove. Works Great! A completely stocked kitchen with more appliances and dishes than you will ever use! Covered grilling area on deck by gazebo. Inside or out. 1,500 square foot deck with 4 tables, approximately 20 seats. 10 seats in eat-in kitchen. A fully-stocked library containing many, many subjects and tastes. located in the Library/den upstairs. Games for all ages, puzzles and stuffed animals. Large gardens to wander filled with many blooming plants, large and small koi pond, lots and lots of bullfrogs and frogs and toads. Large covered front porch with swing and rockers; 1,500 square foot back deck with covered dining area, HOT TUB, gazebo & grilling area; covered side porch; all with comfy seating. Cataloochee is just 15 minutes away! Lots of golf courses nearby! (For Special Events: Request Special Event contract). The Gardener's House is a favorite destination for those who have limited walking skills, since the property is flat and many guests have enjoyed the flat wheelchair access to the house, yard and gardens. Accessible to most wheelchairs. Not accessible to over-sized wheelchairs. Downstairs is wheelchair accessible with no steps through the rear sliding patio door. Pull right up to the flat deck entrance off the driveway for entry across the deck. Property is flat and surrounded by beautiful mountain views. HANDICAP EQUIPMENT AVAILABLE: BATH SEAT, TOILET RISER, BEDSIDE TOILET, WALKER WITH SEAT, STANDARD FOLDING WALKER. Available for our guests' use at no charge. Just give us notice so we can have them in your rental when you check-in. Just 5 miles to the Haywood Health and Fitness Center which has a Whirlpool, Steam, Sauna, Heated Pool, free-weights, great machines, basketball, yoga classes, banked track. Nominal fee. It was winter when I arrived so it was unfortunate that the gardens were not in bloom. I enjoyed listening to the rain on the roof while I was there. Robyn was so accomadating with chocolates and wine as a welcoming gift. Fresh eggs on arrival!I will go back for sure. Wanda, It was a joy to meet you and Chloe. I am so glad you enjoyed yourselves and hope to see you again! Great location and very comfortable! My family of adults and small children had a wonderful Thanksgiving at the Gardeners Cottage. Everything was well furnished and such a nice deck out back to enjoy the beautiful scenery! We especially enjoyed the fire pit and the very nice large table on the back which seats 10 plus many extra rockers and chairs. We loved the chickens and the fresh eggs we found in the refrigerator. Great location close to Waynesville, Asheville, and Cataloochee Cove. Thank you, Robyn, for sharing your beautiful home with us! Hi Sandra, It was a pleasure and I am so glad you all enjoyed yourselves! Hope to see you again soon. I actually loved the property and setting and it was what my son and his fiancé had wanted for their wedding. There were a few factors that contributed to my disappointment. There were construction workers there every day of our stay with the exception of the weekend. It was very disruptive and caused a lot of stress on all of us (mostly our kitty). I had been told that if the project couldn't be completed before our arrival that it would be put off until after our time there, but that didn't happen. Then there was a problem with the TV connection and that didn't get fixed until Friday (the day of the wedding). And the smell in the house was sickening. The owner came and found one dead mouse, but the smell remained after she removed it. She checked again later in the week, but couldn't find anything so we just had to deal with it. I just feel that I paid too much money for a property that wasn't 100%. I would not recommend this property unless all construction/remodeling projects had been completed and the smell issue had been addressed and taken care of. It's truly a shame because the property is beautiful and could have been a very peaceful and relaxing atmosphere if there hadn't been so many distractions. Hi Judy, I am happy you loved the house and property! We are sorry you were unhappy during your stay and make every effort to make our guests happy. At the time of your booking, you expressed a very strong desire for the roof to be replaced prior to the wedding to match your wedding colors (it was originally scheduled for November but moved up for your wedding matching). The repairs and color change (blue to brown which matched your Fall color wedding theme) was moved up and scheduled almost 2 months prior to your wedding, along with prior work which was part of our extensive exterior make-over of new siding, new windows, larger koi pond with tall waterfall, refinished decks and porches, upgraded exterior lighting, new patio and deck furniture on all outside areas and a new covered grilling area by the large gazebo. Unfortunately hurricanes Florence and Michael came through our area causing damage in Western NC and putting the roofers behind on our job since they were making emergency repairs to other homes less fortunate. All this was explained to you in several emails prior to your arrival. I also advised you that we would do everything possible to have the roof finished prior to the wedding so the color would match in your pictures. The roofers worked 2 out of the 3 days after your check-in (they could not work during rain on the 3rd day) and, as promised, finished prior to the wedding in time for your pictures to be perfect. As far as a smell in the house, the guests who checked in after your departure advised there was no smell and we could not find anything which smelled after your check out, other than some odor in the master bedroom where there was cat litter in the corner along with your leftover cigarette smoke in a non-smoking home. That area was disinfected prior to the next guests and no smell was observed by the cleaning crew, me or the new guests after your check-out cleaning. I personally inspected the house after it was cleaned to locate the smell you were talking about but located none other than that of leftover cigarettes which we had to use a ionizer to remove. Robyn, the owner was extremely helpful since we stayed at her home due to evacuating from hurricane Florence. The lockbox was easy to find, the home was extremely clean, there were numerous surprises in the home (complimentary wine, fresh eggs, egg plant and tomorrow’s) and Robyn shared great tips for local places to visit. The mountains were beautiful and the front and back porch were very relaxing. I would definitely stay here again! Thank you, Kim! I am so glad you all got a break from the stress of evacuation and enjoyed yourselves! I hope the trip back home was not too stressful. We wanted to be close to town and other activities, and we were. We still had the quietude of the farmhouse and did not need to worry about our dogs creating a disturbance. Thanks to Robyn, we enjoyed fresh eggs and fruits/veggies from her garden. Moreover, we had the opportunity to make her acquaintance and learn from her about Waynesville. She is truly warm and engaging....makes you feel welcome. We couldn't be happier. It was a pleasure to meet you and Mike (and Jackson and Bling, too!) Hope to see ya'all again when you want to escape the FL heat! Being a retired flower shop owner and interior designer I was in Heaven at Gardeners House!! I love nature! The rolling hills, the sounds of rooster, hens, cows is music to my ears as a country girl at heart! The beds are comfortable and the kitchen functions well. There are window AC units in 3 of the 4 bedrooms. Ceiling fans in most rooms and window fans keep the dwelling pleasant. The koi pond with waterfall is delightful. Sitting in the rocking chairs on the front porch or back deck overlooking beautiful flowering plants brought me and my husband much needed relaxation. The scenery is so beautiful I wished I had had my “real” camera with me!! Many thanks to Robyn for her hospitality! Thanks, Deborah! It was a pleasure to meet you and Bert and I hope to see you again soon! The Gardener's House is the perfect home base for exploring the Smoky Mountains National Park, Cataloochee Valley (elk), Cataloochee Ski Resort, Pisgah National Forest, The Blue Ridge Parkway and Nantahala National Forest. Surrounded by quaint mountain towns with multiple breweries, coffee shops, shopping/antiquing and great dining close by, you are just a few minutes from just about any adventure! If you would like to enjoy the hot tub during your stay, please book at least one week prior to your arrival so hot tub service can be scheduled: drain/clean/refill/treatments--$65 charged separately. Instead of increasing our rates for everyone, we just charge what the service company charges us. Concerned with a possible last minute cancellation? You can purchase travel insurance online at many sites for as little as $17 or 2% - 5% of the trip cost for extra security and ease of mind. That way, if an emergency were to occur, you have recourse for canceling your stay and obtaining a refund. Just google "trip insurance". Just like a hotel, an authorized credit card serves as a security deposit/damage protection--so you do not incur non-refundable insurance fees or pay a $500 deposit. No damage/no charge. See Rental Agreement for complete terms. Weddings/Special Events Packages start at $999.00 (3 Nights) for use of the farmhouse, farm grounds and rear parking area. Rates/fees subject to change without notice. Many sites pick up rental information from other sites and do not always list it correctly. VRBO/Homeaway are generally correct. Owner/Landlord is not responsible for errors caused by other rental listing sites.